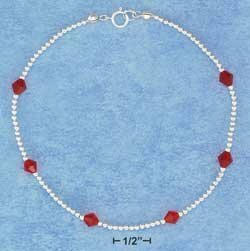 Delicate silvertone bead chain. Tiny heart outline charms dotted with Austrian Crystals dangle. Very dainty and delicate. Black Austrian Crystal dangle on a delicate double silvertone chain. Matching toe ring with Crystal Dangles completes the set.